The paved road, the few concrete houses and men on motorcycles – these are deceptive signs of development in Madralalpur village. 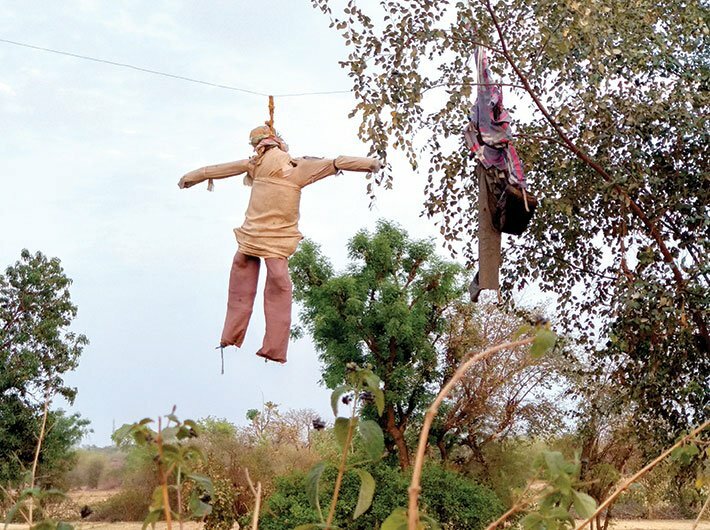 Only a couple of weeks ago, Babu, a 47-year-old distressed farmer, had hanged himself from a babool tree. 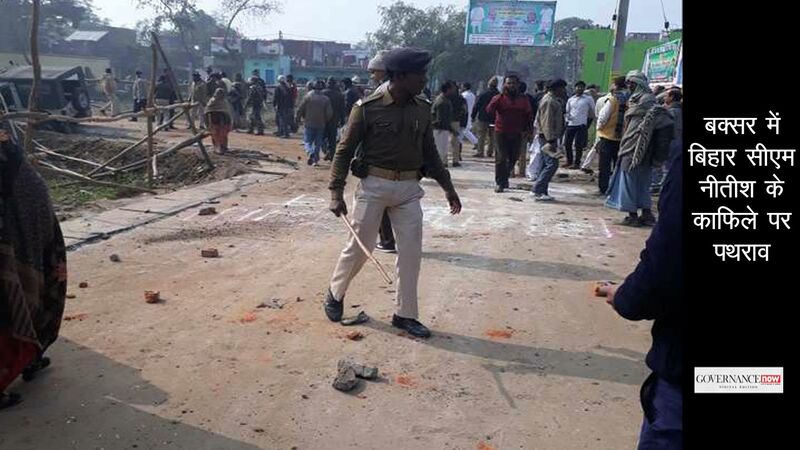 Villagers were gathered at his house as his wife, mother, sister-in-law and daughter-in-law were in mourning, flailing their limbs about on the verandah. Babu’s body had been cremated, but the grief was in the air, live and palpable. Madralalpur lies in the Kalpi tehsil of Jalaun district, formally in the state of Uttar Pradesh. But it’s bound by cultural identity to the Bundelkhand region, named after the Bundela Rajputs who held small kingdoms there for a couple of centuries from the 14th century onwards, and spanning about 15 districts of Uttar Pradesh and Madhya Pradesh. For about 15 years now, the region has become synonymous with drought, farm distress, farmer suicides. The region may have seen many farmer suicides, but this was the first in Madralalpur. So the villagers are apprehensive. Many of them are debt-ridden, like Babu was. His sons Bhan Singh and Man Singh, both in their 20s and married, are worried about whether the bank he owed money to will come after them. Like many other youths in the village, they have given up on farming. For three-four months every year, they go away to Surat, in Gujarat, to work as labourers on construction sites. The Rs 200-250 daily wage they earn there is more than what the NREGA scheme will give them in their village. The villagers know that Babu was diligent and hard-working. It’s just that the rainfall has failed the village for more than three years now. He owned eight bighas in the Chambal ravines. All that would grow there was pulses. But with no rain, even growing daal, tur, gram or a hardy millet like jowar was impossible. The two tubewells in his fields went dry. Not one to give up, Babu had joined hands with three other farmers and taken three bighas of better farmland on lease to grow paddy. A hailstorm ruined the crop. There was threshing to be done, but the thresher lies unused. It would have made a big difference to a region like Bundelkhand, which in the last 15 years has had adequate rainfall only in 2009, 2012 and 2016. Last year was particularly hard, and this year, average rainfall has been just 350 mm against the normal 1,000 mm. Historic lakes and ponds in the region are dry. One of the most famous lakes here is one spread over 62 acres in Panya village. It’s believed to be more than a thousand years old. The dry lake stands in stark contrast to the name of the village, which in local dialect means water. “Ground water is more than 200 feet below the surface and we have perhaps just a month’s supply,” says Latif Ali, a village elder. Some 2,000 people used to live in Panya. Only about 500 people remain. The rest have migrated to cities in search of work. Another famous pond of the region is the Buddha Sagar, in Bangany village, in the Jatara block of Madhya Pradesh’s Tikamgarh district. It dates to the eighth century, the times of the Chandela Rajputs, who pre-date the Bundelas, and supported life in the region. But it’s dry this year, and all the ten handpumps in the village have gone dry. The population of the village is about 1,200, but only about 150 elderly people remain. Everyone else has migrated to the Delhi NCR region for work. The old survive on meagre government pensions of Rs 150-500 monthly, depending on age. There are 20 widows, who get a pension of Rs 200 per month. For water, they depend on the Paramarth Samaj Sevi Sansthan, a Jalaun-based NGO that sends water tankers to villages in the region, helps them build check dams, offers help to needy farmers. Sanjay Singh, who works for the NGO, chimes in, “The ground is rocky, and we had to depend on surface water or rainfall. Now, there’s no rain, no water, no crop.” Villagers had tried to bore deep to get water but failed. Singh says mahua fruit, obtained from the forests, was a major source of income. Farmers could earn up to Rs 10,000 by picking and selling the fruit, but this time, there was no fruit because of bad weather in March. This has never happened before. “Around 3,000 farmer suicides have been reported from Bundelkhand in the last 15 years,” says Singh. Once again, severe drought and water crisis is causing a spurt in farmer suicides but the government quite often does not recognise all of them as such. The death of Bikram Aherwal, 39, a resident of Pattharwada Tola of Khajuraha Bujurg village in Babina block of Jhansi district, is a case in point. Police records say he died on November 19 last year, when he came under a train while chasing away animals near his fields. His wife Rajkumari received Rs 5 lakh in accident relief from an insurance company too. She says she has all reasons to believe her husband’s death was accidental. But she does concede that he was heavily in debt. Bikram owed the Grameen Vikas Bank Rs 2 lakh. He had taken loans for the treatment of his 10-year-old daughter who has a congenital heart defect. He had borrowed Rs 50,000 from four moneylenders, Rs 18,000 from yet another moneylender, mortagaged his wife’s silver ornaments for Rs 7,000 at five percent interest, and taken away her gold mangalsutra, apparently to raise money for getting a borewell sunk. Villagers say that hardly four people have been mowed down by trains in the region in over 20 years, whereas there have been quite a few suicides by distressed farmers. So they have reason to suspect that Bikram too may have committed suicide. Bikram’s younger brother Brajman wants a proper inquiry. He too has a bank loan of Rs 80,000. “I had borrowed Rs 32,000 in 2004 for a diesel water pump. But since there has been no crop for the last 10 years, I am unable to repay the amount. With interest, it has gone up to Rs 80,000,” he says. Another brother, Ratiram, too, owes a bank Rs 80,000. The three brothers had inherited 4.68 acres, which they divided among themselves. Bikram, however, had sold part of his share for Rs 90,000 for his daughter’s treatment. “After his death, we don’t know whether our daughter will survive or not,” says his wife Rajkumari. She says she’s harassed by moneylenders whom she doesn’t know, as they aren’t from her village and her husband never introduced them to her. She says that the village head refuses to help her renew her BPL ration card. The pradhan, though, says he’s unable to help because it’s difficult to access the website. Siddhgopal Singh, a panchayati raj trainer, says it shouldn’t be difficult for the pradhan to get the BPL card; besides, Rajkumari could also avail herself of the pension for widows and get a job thorough NREGA. 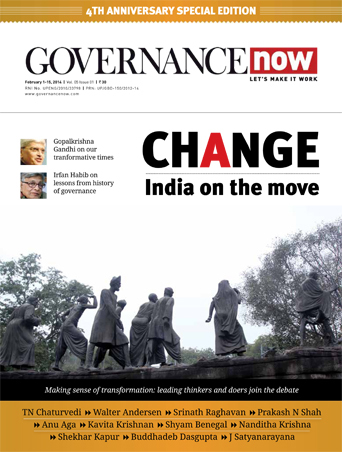 But it would still be difficult for her to manage, since the pension and NREGA payments are meagre. And her fears about not being able to get her daughter treated are, alas, well-founded. The government is yet to wake up to the distress call. Sources say that in Jhansi district alone, 313 villages are drought-affected, and that agricultural loss was almost 25 to 30 percent more than last year. There’s no contingency plan yet. In fact, even regular work has not been done: villagers complain that soil health cards (which come with recommendations on what crop to sow, what fertiliser to use) have not been distributed during the last four years. Queries about suicides are stonewalled: officials in the administration in Jhansi, for example, say they have no suicide statistics for this year. Already the issue is being politicized. As Beer Pal Singh, Jalaun district president of the Samajwadi Party, claimed, he had a complete list of suicide cases and that he had visited the families to check. “We have clear instructions to visit each and every affected family and our party is going to make it a big issue in the coming state assembly session,” he says. But politics apart, what is largely required is the political will and determination to get into the root of the crisis. As Anil Singh, a former teacher based in Orai, the district headquarters of Jalaun district, said growing multiple crops and adaptation to climate change could be two such solutions, besides training women on water conservation methods.